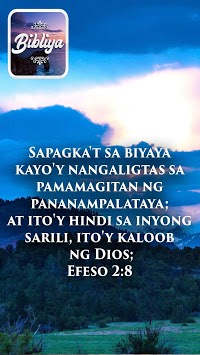 Filipino audio version of the Holy Bible to download for free. 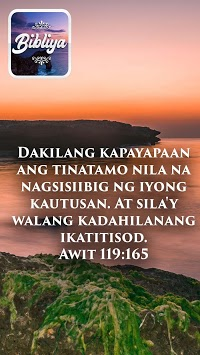 - Enjoy this new Bible app that offers an audio version of the Bible in the Tagalog Filipino language. If you cannot read the Scriptures, an audio Bible will be very useful. Listen to the Holy Word of God while you drive, rest, walk or cook. Touch the audio icon to select the chapter or verse you want to hear. A new way of experiencing the Word! 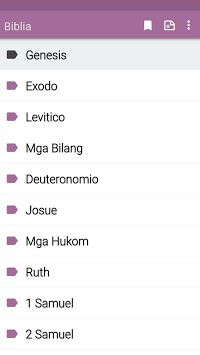 - Our app consists of the complete Ang Dating Biblia (ADB) 1905 containing the Old and the New Testament. Now millions of Christian devotees in the Philippines and all over the world can access the Holy Bible in Filipino or Tagalog. The Philippines is one of the top Christian countries in the World, with more than 86 million of Filipinos adhering to Christianity. Of the Filipino Christians, 81 percent are Catholic and 11 percent Protestant. - Access to the Ang dating Biblia is totally free of charge. Download it, use it, read it and share it without having to pay anything. The app works offline so you do not have to worry about any connection. Once downloaded you can use the app everywhere. - Our app allows users to bookmark and highlight verses or passages and add them to favorites. You can also customize your Bible adding notes. - The app enables you to bookmark and share the content across the Internet by e-mail or through social networks such a Facebook, Twitter or Instagram. It is so good to share the Holy Word with others! - The app will allow you to quickly increase or decrease the font size. Select the text size you want according to your preference. - Every time you open your Bible app, it goes back to the last read verse. - You can easily search by keyword. - Change the screen brightness on night/day mode. In Night Mode, the page will be fading to dark and the text will be adjusted to the dark color as well. In Day Mode, the page and the text will be switched to normal. Ang dating Biblia will become your favorite app! Now it is easy to read and study the Bible. Open your Bible now, read it, enjoy it!